An offshore company is a legal entity incorporated in a country or jurisdiction with little or zero taxation. The benefits that an offshore company include zero corporate tax, flexible business laws, asset protection and confidentiality, protection from political and economic changes and the risks, associated with them. In order to maintain a tax exempt, the offshore company must not trade on the territory the country of incorporation. There are plenty of places, where you could incorporate your offshore company, which suit and serve different business needs. We recommend jurisdictions that provide the minimum requirements of zero liability, confidentiality, and asset protection. Depending on your business structure and objectives, Belize is one of the best options to choose. Other compelling jurisdictions to consider, depending on your business plan are Cayman, BVI, Antigua and New Zealand. Here are some of the best features of certain locations. For simplicity: Seychelles, Nevis or Belize. For asset protection: Cook Islands. For operating a business internationally: Panama. For doing business in Asia: Hong Kong or Singapore. For financial services or ForEx licensed entity: Belize, Panama or New Zealand. For hedges funds or compatibility with U.S. regulation: Cayman Islands. Operating through an offshore company allows you to conduct your business efficiently and on a level of privacy and anonymity. 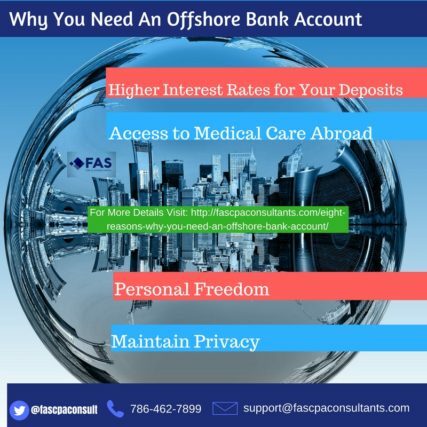 Holding bank accounts and assets in an offshore company, rather than in your name, maximizes security. In many jurisdictions, the company officers, shareholders, and beneficial owners are not on public record and their privacy is guaranteed by statute. An offshore corporation, also referred to as an International Business Company or Offshore IBC, while Both structures provide the same level of asset protection but are treated differently the tax code. An Offshore IBC or offshore corporation is an entity separate and distinct from its shareholder(s) and is best suited to hold an active business that will generate net profits in excess of the Foreign Earned Income Exclusion amount and for complex offshore IRA structures. If you, as the owner of a business, are living and working abroad, you may be able to defer U.S. income tax on net operating profits by retaining income in an offshore IBC. An offshore Limited Liability Company is tied to its members as a pass-through entity for U.S. tax purposes. A sole member offshore LLC is treated as a disregarded entity for the IRS. This investment and asset protection structure has simplified U.S. reporting requirements and will reduce your annual maintenance costs with the IRS if selected. To manage your Self Directed IRA. To hold an offshore bank account for a U.S. resident seeking asset protection. To hold an international business that is expected to generate net profits that are less than the Foreign Earned Income Exclusion. A multi-member offshore LLC is also a flow-through entity for U.S. tax purposes. However, it is reported as a partnership and requires a complex tax return. Offshore LLC partnerships are primarily used in joint venture arrangements. To discuss the benefits of IBCs and LLCs, click the button below and schedule a consultation. We will gladly give you more details about the offshore structures and their requirements, clarify any information and answer all of your questions.